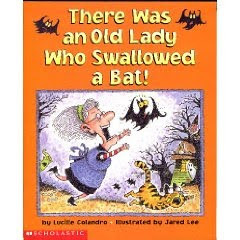 This week we read I Know an Old Lady Who Swallowed a Bat!, by Lucille Colandro. This is a fun repetitive Halloween version of I Know an Old Lady Who Swallowed a Fly, which is one of Emily's favorite books! I found this great project idea and new that I had to try it this week with Emily. All I needed was a Ziploc sandwich bag, printout of "The Old Lady" and some crayons. I cut the Old Lady in half and Emily colored in her top and bottom. Emily glued the Old Lady's head to the top of the bag and the feet to the bottom. I printed out cards with the different things she swallowed to go into the bag. Emily LOVED this project. It will be great for helping us retell the story!! It all started with a trip to the pediatrician because Juliette felt warm and was just not acting like herself and ended up with a trip to the ER and a six day stay in the hospital. Juliette had a 104 degree temperature and the Dr's couldn't figure out where it was coming from. We finally found out that she had a really bad Kidney Infection. I spent the next 5 days in the hospital with her waiting for her temperature to come down. She will still need more tests to find out what caused the infection in the first place, they think it might be a result of reflux. The radiologist originally saw a blockage in the kidney that he said was a congenital defect, after the third ultrasound they did not see it anymore and he had no explanation as to where it went. All I could do was thank God!! As I was sitting in the hospital waiting it put so many things into perspective for me. I am blessed with so many things in my life that I take for granted. I realized I would trade all the material things I had at that moment just for Juliette to be well again. I am so grateful for all that God has blessed me with and plan on enjoying every moment that I have together with them. This week we read The Stubborn Pumpkin , by Laura Geringer. 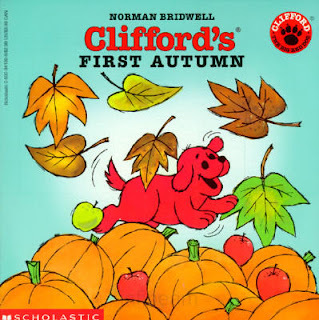 This is a cute repetitive story about a farmer who tries to pull a gigantic pumpkin from the vine. He asks for help from his wife, daughter, cow, dog, cat and finally a little tiny mouse. After reading this book we decided to make our own pumpkin. I asked Emily if she wanted to paint or glue. She was in a gluing mood so I got her some orange paper and glue to make a torn paper pumpkin. Emily riped the orange construction paper into little pieces. I cut a pumpkin shape from a piece of white card stock and Emily glued on the orange paper pieces. I cut a green stem and Emily glued on the stem. Laughter a lot of it and a touch and feel book! Emily adding in the sugar. Emily helping layer the apples on top of the batter. Peel 4 apples. Core and cut each apple into 16 slices. Cook for 55 minutes at 350 degrees. After cake is cool, whisk together 3 tablespoons apple juice and about a 1/4 powdered sugar and dribble over the cake. This is probably Juliette's favorite game and it is so simple. She loves to copy! To play I just sit in front of her and make faces, stick out my tongue and say "Hello." She tries to copy almost all of the time even since she was only a few days old. Sometimes she actually sounds like she is saying "Hello" her mouth actually moves the way you would if you were saying it! Emily even likes to get in on the fun now and stick her tongue out to get Juliette to copy her. Here is a clip of Juliette sticking out her tongue, I ask her where her tongue is and also show her mine. Usually by the third try she copies me. This weeks theme for Muffin Tin Monday is "All About Me" so we made a muffin tin lunch that tells you a little about Emily! Emily's All About Me Muffin Tin Lunch!! Bottom Row: Green Yogurt since Emily's favorite color is green, Curly pasta since Emily has curly hair and is part Italian, Mango Applesauce since Mangoes are one of Emily's favorite fruits. We will be working on some "All about Emily" projects later this week to continue this fun theme! Emily is 31 months old. This week we have been doing circle time in the morning. We sing the Days of the Week Song and then we put the day of the week word on the door. Since we have been talking about the letter Aa Emily was very excited to point out the letter Aa in each of the days of the week. We also talked about the weather each morning and put the correct weather card on the door. Then we sang some songs together. I brought Juliette over to sit in her bouncer and she actually started making sounds to sing along with us. The favorite song of the week was "Teddy Bear Teddy Bear" Emily enjoyed doing the different movements that go along with the song! Emily enjoyed Music Class at my friend Sarah's house. We have been meeting for over a year now and Emily loves singing the songs and playing the instruments. For our Unplugged Project we did a feather painting. Emily glued the feathers on when she finished her painting. We got some new play dough toys and Emily has wanted to play with them almost every day. This sprinkle maker is now her new favorite! We dyed eggshells for our open ended art project. Emily was so excited to fish the eggshells out once they were all colored. She did a great job with this, there were NO spills I was so amazed at how careful she was the whole time. Emily and Daddy got to work on an Eggshell mosaic for our Open Ended Art project. For our stART project this week we read "Do You Have a Hat" and "Go Dogs Go" and then we made our own paper hats and decorated them with Sequins and Spangles, stickers, feathers and markers. This was a great fine motor activity! We have been working really hard to use up the 25.5 pounds of apples we got when we went apple picking. It has been a lot of fun trying lots of different apple recipes. This week we made an apple cake. Emily really liked being able to arrange the apples on top of the cake batter. Emily got out her giant coloring book and was having fun coloring on the floor with Juliette. I loved how intently Juliette seemed to be watching Emily. I know she can't wait to join her in everything that we do! Emily and I had fun singing "Who Stole the Cookies from the Cookie Jar" and I was actually able to get it recorded. We have done this song in our Music Class and Emily was asking me to sing it to her. Brown Bear, Brown Bear, What Do You See? ~ Bill Martin Jr. This month's Open Ended Art theme is Mosaics. This weeks material is eggshells. We have been saving our eggshells for the past 2 weeks and had a huge bowl full. I was so excited for this project. Emily and I dyed them 8 different colors and glued them on a piece of construction paper. Emily dropping the shells into the dye. She did a great job scooping them out too! They made a beautiful design on the paper towels as they were drying. ...and put them in our muffin tin. Emily gluing the eggshells down. Daddy came home from work and helped work on my project, Emily was very excited! Emily's finished (for now) Mosaic.